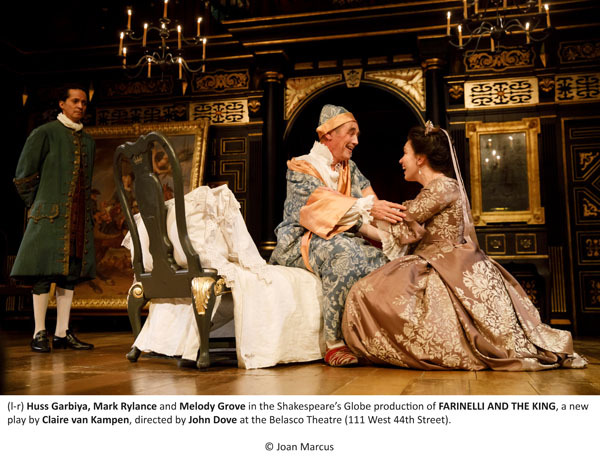 Mark Rylance’s appearances on New York stages are always a cause for celebration, whether he is performing Shakespeare, a bracing new play (e.g., “Jerusalem”) or even a minor comedy (“Boeing-Boeing”). 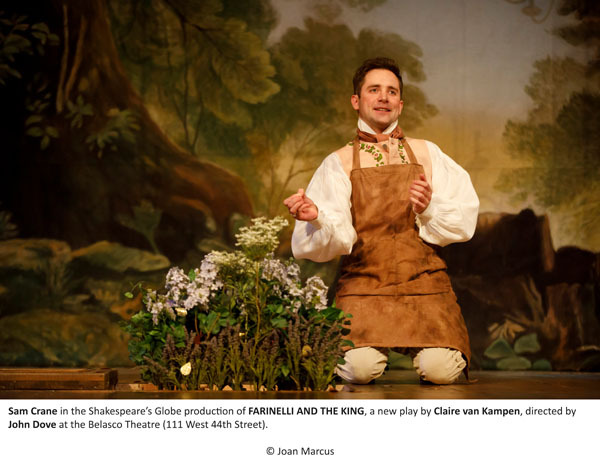 He is now back in “Farinelli and the King,” an import from Shakespeare’s Globe Theater in London. 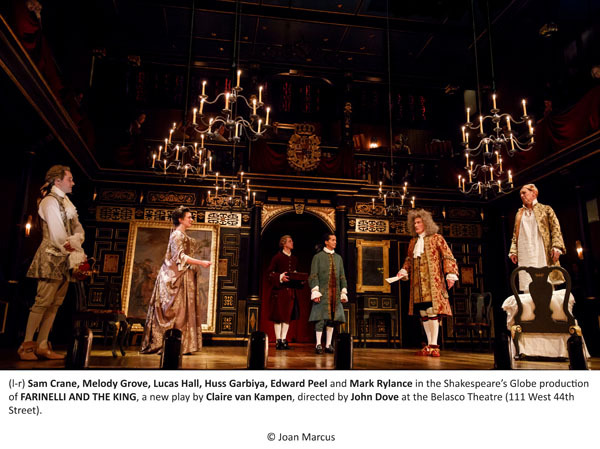 The script by Claire van Kampen (Rylance’s wife) is fascinating and the production has many merits aside from the brilliant performance by Rylance as the King. This strange and compelling play is actually based in fact. Farinelli (1705-1782) was probably the most famous castrato tenor of all time. He was a leading opera star, when the Queen of Spain hired him to sing for her husband, King Philippe, who was suffering from chronic depression. Farinelli remained in Spain as the monarch’s artist in residence until Philippe’s death. According to van Kampen’s script, the King was, at the beginning at least, quite mad, conversing with goldfish. 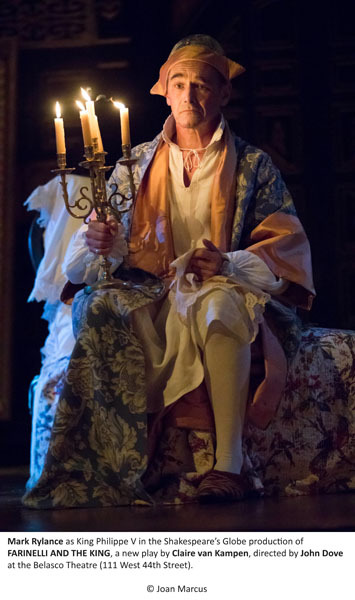 Moved by the beauty of Farinelli’s singing, the King regained enough of his sanity to function as a ruler, albeit an eccentric one. The nine baroque arias performed in the play were all sung by Farinelli during his career, and include “Ho perso il caro ben” from “Il Parnasso” and “Bel contento” from “Flavio.” Davies is a world-class singer and his singing is enjoyable on its own terms, even if it probably sounds nothing like Farinelli (of which we only know from contemporary descriptions of him and other castratos). The musical arrangements are by the multi-talented van Kampen. 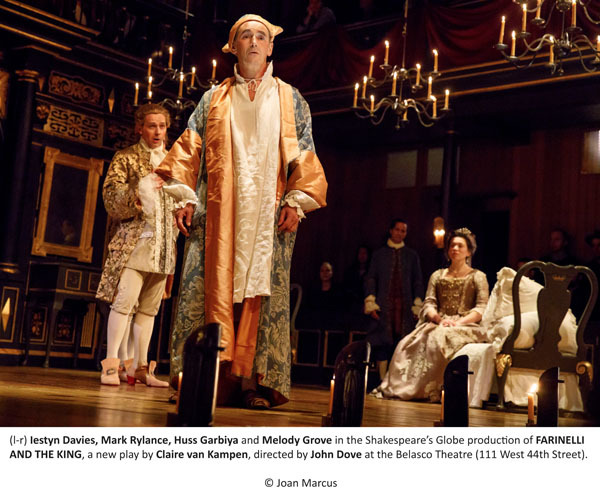 Directed by John Dove, the production is also a feast for the eye, with its candle-lit set and elaborate costumes (by Jonathan Fensom).